There are a wide variety of citaiton management tools to help researchers create and maintain bibliographies or reference lists, allowing users to format and export citations according to different style guidelines. In addition to creating bibliographies, these tools can assist users with in text citation creation as well as provide a storage and organization solution for the referenced documents. Endnote provides tools and resources for users including a quick reference guide and tutorials. Additionally, the NOAA Central Library provides a wide variety of support for Endnote users including in-person and online training sessions, videos, and guides which can be found on the library instruction page. To download this program please visit the NOAA Google Sites Endnote page. While Mendeley is free to download, NOAA employees and contractors will need to contact their IT department for approval. Although Zotero is a free, open source software, NOAA employees and contractors will need to contact their IT department for approval before downloading. A unique, persistent identifier can help distinguish authors from others with the same name and provide a link between an author and their professional activities. There are a number of online resources that allow authors to create and manage a unique author identifier; some of which can be used in conjunction with one another allowing researchers to measure their impact within the scientific community. Open Research and Contributor iD (ORCiD) is a non-proprietary, alphanumeric code assigned and maintained by the non-profit organization ORCiD Inc. To learn more or set up your ORCiD, visit their website. ResearcherID is a free of charge registration service from Thomson Reuters that connects an author's works across the Thomson Reuters suite of products. Additionally, ResearcherID is integrated with Web of Science and works with ORCiD, making it easy to manage both profiles from one account; with the other automatically updating/populating. Please visit their website for more information or to set up your identifier. Additionally, authors can set up a profile in Google Scholar to track who is citing your publications an other author metrics. For more information, visit the Google Scholar Citations page. For more information or assistance registering for any of these IDs, please contact library.reference@noaa.gov. A digital object identifier, or DOI, is a persistent, unique alphanumeric identifier that provides a persistent link to an object (most commonly a document, article, or dataset). DOIs are assigned by registered agencies that are part of the International DOI Foundation and are assigned by publishers to documents that are available electronically. If you have a data set that you would like a DOI to be created for, please contact the National Centers for Environmental Information (NCEI) or submit your data directly at Send2NCEI. The library does not assign DOIs to peer-reviewed articles. Please contact the Institutional Repository for more information. 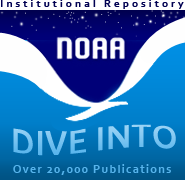 The NOAA Institutional Repository is a digital space curated by NOAA Libraries to collect and disseminate materials published by NOAA authors ensuring that NOAA intellectual output is preserved and made available for future users, and allows for better assessment of the current and future impact of NOAA research. For more information on the repository including how to search and submit, please visit our repository page or our submission FAQs. NOAA authors can submit publications via the Institutional Repository Submission Form or visit our Frequently Asked Questions page. Please visit our bibliometrics page for more information or contact Sarah Davis (sarah.davis@noaa.gov) or Jamie Roberts (jamie.roberts@noaa.gov) for assistance with any of these tools. Section 508— an amendment to the US Workforce Rehabilitation Act of 1973— mandates that all federal agencies make their electronic and information technology (such as publications, presentations, software and websites) accessible to people with disabilities. In making documents 508 compliant, these documents and web pages are then accessible to people with disabilities via assistive technologies such as screen or text readers. The library requires that documents submitted for inclusion in the NOAA Institutional Repository be Section 508 compliant. For more information about Section 508 and to access helpful tools to create compliant documents or remediate non-compliant documents, please see the library's LibGuide on Section 508 Compliance.